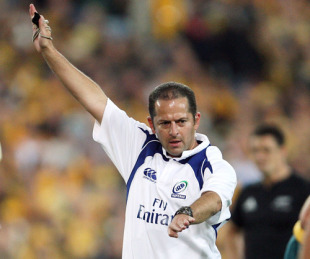 As Jonathan Kaplan approaches the milestone of becoming the first referee to take charge of 100 Super Rugby matches, the reality is increasingly dawning: The end is near. The 46-year-old Capetonian last week made an announcement in conjunction with the South African Rugby Union that 2013 will be his last year after over two decades as a referee on their panels. "I've been refereeing for 30 years and been involved at national level for 21 years. When you have done something for that long, it feels as if something in you is about to die," Kaplan says about his retirement at the end of the year. "But it needed to be done. The incentive of Test rugby has been taken away from me. There comes a time where you have to stop. This is probably as good a time as any." Kaplan notched numerous milestones over the years. His 68 Tests are a world record, he has refereed five Currie Cup finals, three Super Rugby finals, 150 Currie Cup matches and been at four Rugby World Cup tournaments. And, of course, he will be a centurion in Super Rugby when he runs out for Saturday's match between the Cheetahs and Sharks in Bloemfontein. Kaplan started refereeing as a hobby and his first match was a club clash between the fourth teams of Wits University and Kempton Park in Johannesburg in 1984. He started refereeing first class rugby with a match between Eastern Province and the SA Barbarians at Ellis Park in Johannesburg in 1993. As the years progressed, Kaplan grew in stature and commanded immense respect worldwide. "My philosophy is encapsulated by the words - flair, judgement and nerve," he said. "Judgement is the ability to see right from wrong in terms of the black and white of the laws. Flair is the ability to add colour to a picture, in other words your management style, non-verbal cues and game understanding. The importance of adding colour is to have a product that is better for the players first and foremost, and the public thereafter. "Nerve is the ability to referee under pressure. Sometimes you can't teach that. It's in your character." The Tri-Nations match between New Zealand and Australia in Wellington in 2000, where Wallaby captain John Eales sealed a 24-23 victory with a last gasp penalty. It was a match between the best teams in the world at the time. The World Cup match between England and Samoa in 2003, which was a highlight of the tournament. Wales' 46-22 victory over Scotland in a Six Nations match at Murrayfield in 2005. The latter he particularly liked because the ball was in play close on 44 minutes. Free State's upset victory over the Blue Bulls in the Currie Cup final of 2005 and the Crusaders' remarkable 96-19 Super Rugby win over the Waratahs in 2002 were other favourites. The latter included the best half of rugby he ever witnessed after the Crusaders led 63-0 at the interval. 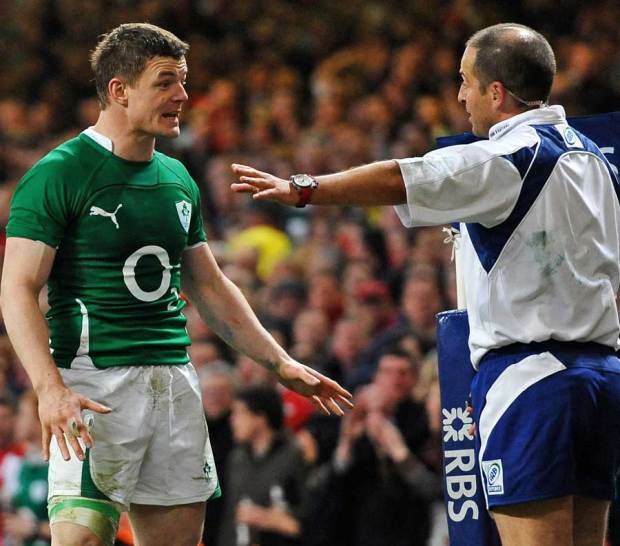 Of course all referees make mistakes and Kaplan has no hesitation in pointing to the debacle in the Six Nations match between Ireland and Wales in 2011 as the "low point" of his international career. Wales scrumhalf Mike Phillips scored a try that shouldn't have been awarded. The Welsh won 19-13. "A lapse in concentration had a profound influence on the game. The ball was kicked out and the wrong one was taken. No excuses, it was a poor call," said Kaplan. But you don't referee a record number of Tests without your contribution transcending the inevitable human error along the way. Kaplan takes particular pride in matches generally being a pleasure to watch when he's carrying the whistle. He said: "There are many stakeholders who rely on my performance. But like the conductor of an orchestra my primary responsibility is to the people making the noise, which are the players. If I can get their trust and buy-in, the game will inevitably be better. "I'm very fortunate that I'm involved in Super Rugby and to a lesser degree the Currie Cup. There is a high tempo to Super Rugby games and a lot of razzle dazzle. People are prepared to take chances and I think I am as well sometimes. You get different personalities among referees as well. Sometimes taking risks is part of what we do. There are sometimes grey areas in what we do and then it's how you work with that to create a better product for everyone." While the pressure is immense and referees are subjected to a lot of uninformed criticism, Kaplan has found his job immensely fulfilling. "What makes it worthwhile for me is when I feel the satisfaction of the players and then to a lesser degree the public," he says. "The response of people after last week's announcement was also a humbling experience. I'm not shy to say that I shed a tear at reading some of the comments on social media because most of those people I've never met and never will. "What I've found extremely gratifying is that I have put the best years of my life into this hobby and passion. I can't make everyone happy, but by and large what I've done has been noted by the public and that really pleases me." Kaplan has not got any firm plans for life after professional refereeing just yet, but lists game analysis and a potential media role as a refereeing commentator as options. Irrespective of what he does, he won't hang up the whistle completely. "I'll still referee club and schools matches as long as there is a need. It started as my hobby and will also end as my hobby."